Saturday May 13th 2017, is a date that will go down in the annuals of the history of the football team I support Ebbsfleet United. I headed to the teams home ground Stonebridge Road, full of expectation that we would win a home National League South Play off Final at home, at the third attempt. As we were playing Chelmsford City from Essex rather than a third team from Kent expectation was not tempered with the fear of an unwanted hat trick as it could have been. The first half of the match wasn’t the greatest 45 minutes I watched this season. Expectation that we would achieve our aim was still there as we entered the final few minutes of the half. Then things all changed and despair set in. Ebbsfleet winger Anthony Cook ‘Cookie’ to the fans, was sent off. At the start of the second half Ebbsfleet manager Daryl McMahon reshuffled his pack. Withdrawn was club captain Danny Kedwell who had started his first game since breaking his forearm in two places. On came midfielder and free kick exponent Jack Powell, despair eased slightly. Then despair turned to dejection. 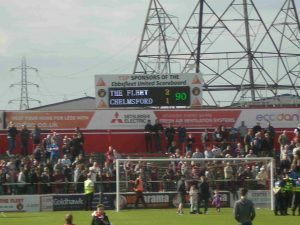 Chelmsford took the lead, I was slumped in my seat, in the soon to be rebuilt Plough End, utterly dejected that history was repeating itself. Perhaps I should have known better with this team. I’d seen, heard or followed on Twitter as they had come back from losing positions before, we hadn’t lost a league match in 2017. Then a period of four minutes in the second half turn dejection into elation. I can’t say much on the equalising header from centre back Dave Winfield due to all the jubilant fans in front of me, although I remember seeing him go for the header. Four minutes or so later, not that I had an appreciation of the time interval on the day, elation was starting to turn to ecstasy when speedy young forward Darren McQueen scored to give Ebbsfleet the lead. I know more about it from the match highlights and Facebook videos, than I do from actually being there. The scoreboard clock ticked onto 90 minutes and the fans starting singing about promotion, but others quickly stopped the chants, remembering all too well the final minutes of the 2016 Final. As the Referee blew his whistle to end the match all hell broke loose. Ecstasy set in among the 2,300 odd Ebbsfleet fans as the relief that the team had achieved promotion set in. On to next season and to playing teams like Tranmere Rovers, Hartlepool, Leyton Orient and Dagenham & Redbridge, all ex-Football League teams in recent years.